9. Wash newly painted car. Traditional auto body dent repair is required when the metal of your vehicle is stretched upon impact or if the dent is too deep to extract. This type of repair is also appropriate when extensive paint damage from the impact exists. To repair these dents, we’ll straighten out the affected areas and bring them level with original surface. Once the damaged area has been straightened or flattened sometimes uneven metal ridges are still sticking out. 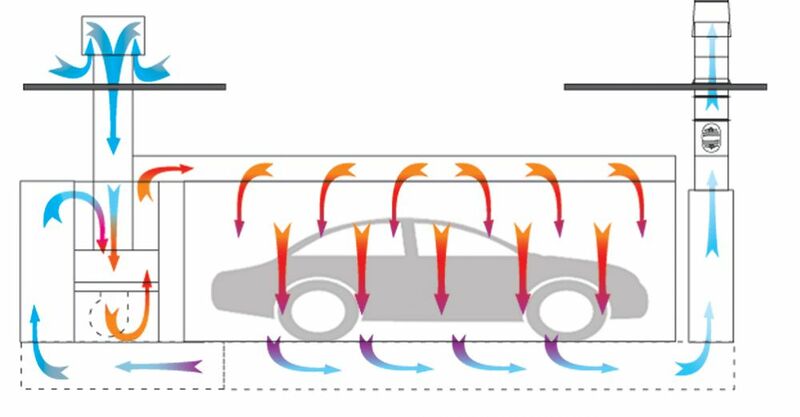 This can be caused by the metal stretching during a collision. To fix this, we grind out any uneven metal ridges that could pose a problem. 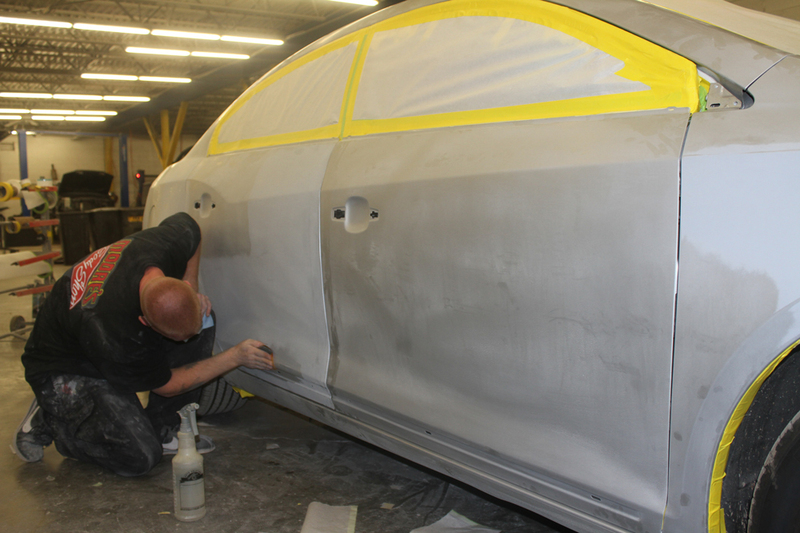 One of the most common tools for auto body work is body filler. When some areas are too deep or damaged to repair we use body filler to even out the gaps. This allows us to create a hard, even surface to sand down a prepare for painting. When the filler dries, the sanding starts! This step is to remove the top layer of your car’s paint, usually the clear-coat or primer, and create a surface for new paint to adhere to. 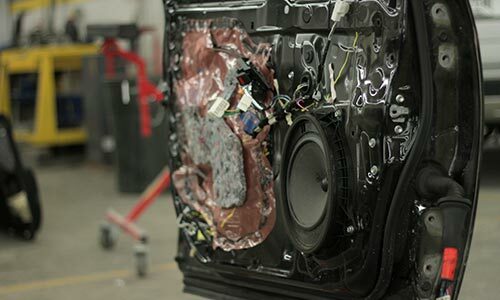 As one of the most important parts of paint preparation, we invest our time to make sure it’s done right. With all that sanding comes lots of accumulated dust and non-binding particles. To stop these things from causing “fish eye”, bubbles, and an uneven coat, we clean off everything. Using a blow gun attached to an air compressor we clean off any accumulated non-binding particles to make sure your ride comes out with a beautifully smooth coat. 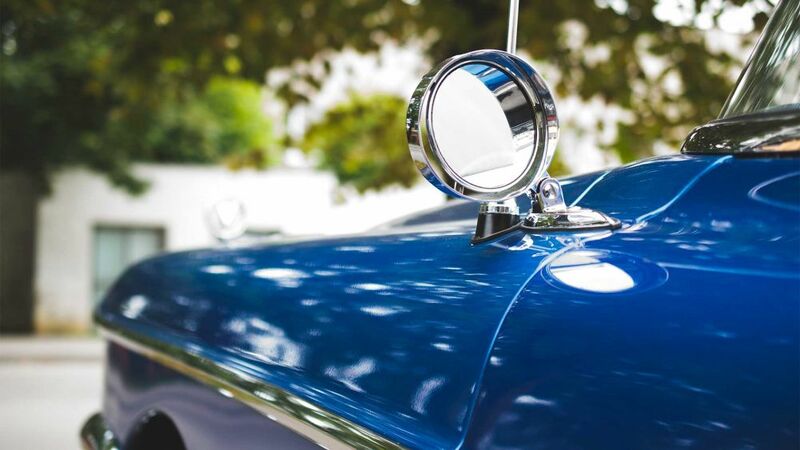 Once your vehicle is smooth and clean, masking tape will be applied around or under the edges of the area being covered, with half of the tape adhered to the car and the other half left loose, waiting for the next step in the process. Masking paper or film is then layered over the vehicle to fit. The covering will also have masking tape attached to it. Half the tape will be adhered to the covering while the other half is lined up with the tape that's already on the body of your car. 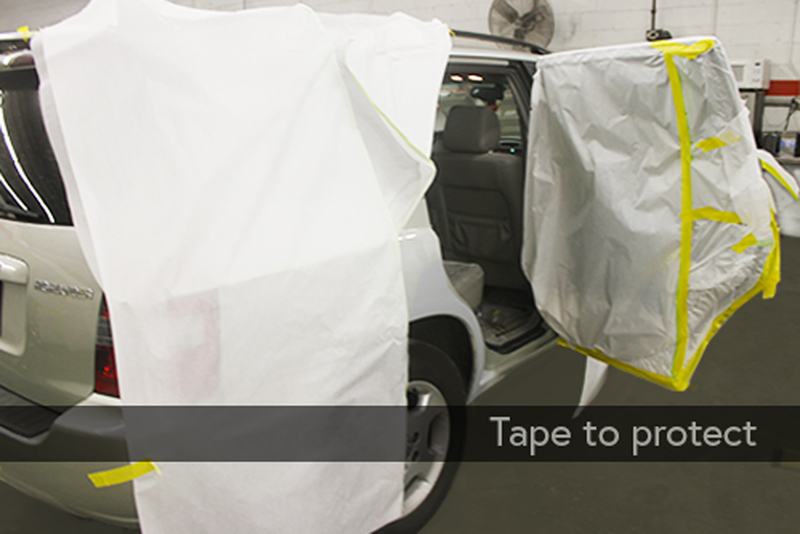 The coverings will will be affixed once they are known to fit and cover the entire portion of your vehicle that won't be painted. During finishing warm dry air is filtered, pumped into the booth from above, and suctioned down and out of the booth. This process is continued until your paint is completely dry and your car is ready to be washed. Our car wash and detail shop is separate from the rest of our body shop. When your car exists the paint shop freshly painted and fully dried it is taken to the washing area. Once washed and dried your car will be driven from the shop and parked in our lot for pickup.